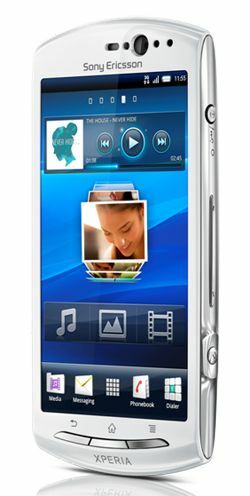 Sony Ericsson unveils Xperia neo V smartphone, prepares Android update | What Hi-Fi? New from Sony is the Xperia neo V (right), due on sale in the final quarter of this year. It runs Android Gingerbread v2.3.4, is powered by a 1Ghz Snapdragon MSM8255 processor, has a 5MP camera for 720p HD video recording and a front-facing camera for video chat. There's also HDMI support, a 3.7in 'Reality Display' with Mobile Bravia Engine, and 3D sweep panorama mode (so images can be captured and viewed in 3D on a 3D TV using the HDMI connection). A raft of other features include stereo A2DP Bluetooth, Sony Ericsson music player, web browser, Facebook and Twitter apps, Google Talk, 3D games, FM radio with RDS and DLNA/micro USB support. From October, Sony will issue a software upgrade to add Android Gingerbread v2.3.4 to its entire 2011 Xperia smartphone range. This will bring improvements to Sony Ericsson's Facebook inside Xperia function, as well as adding 3D camera functionality and Google Talk video chat.